Make money from your wardrobe. We would love to help you re-home your loved but now unworn clothes. We have certain styles that we specialise in so our customers know we will always have in stock the items they like. These are the clothes you have difficulty in letting go of and we aim to make it worth your while to do so! It costs £2 to rent a hanger for up to 1 month, and you will receive 70% of the sales price. For those of you looking to build up your wardrobe choices, please consider our collection of clothes, carefully selected for their style and condition. We love textiles, texture, art and fashion and enjoy sharing our passion. 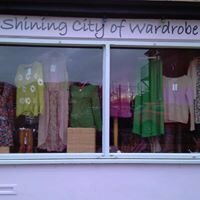 All of us at The Shining City of Wardrobe are much looking forward to meet you.